Of the many barges in France, The Savannah is a stand out. The luxury barge is a fire engine red and black luxury barge, lovingly restored by owner and our captain, Adrien Bramoullé. With an extensive career in veterinary science and business, Adrien travels regularly between South Africa and France. “I retired at 45”, was one of the first things Adrien told us when he picked us up from our hotel. Whilst he may have left his corporate life at 45, Adrien’s version of retirement still involves plenty of hard work. With the 100-year-old barge, Savannah and a part ownership in a private safari lodge in South Africa, Adrien is as busy as ever. But, from the look of him, he’s loving life. His passion, along with an obsessiveness about delivering the ultimate customer experience to his clients, guides every part of the week-long cruise on the Canal du Midi. Where Does the Canal Cruise Go? This would have to be one of the best barge trips in France, when you see the route it takes. 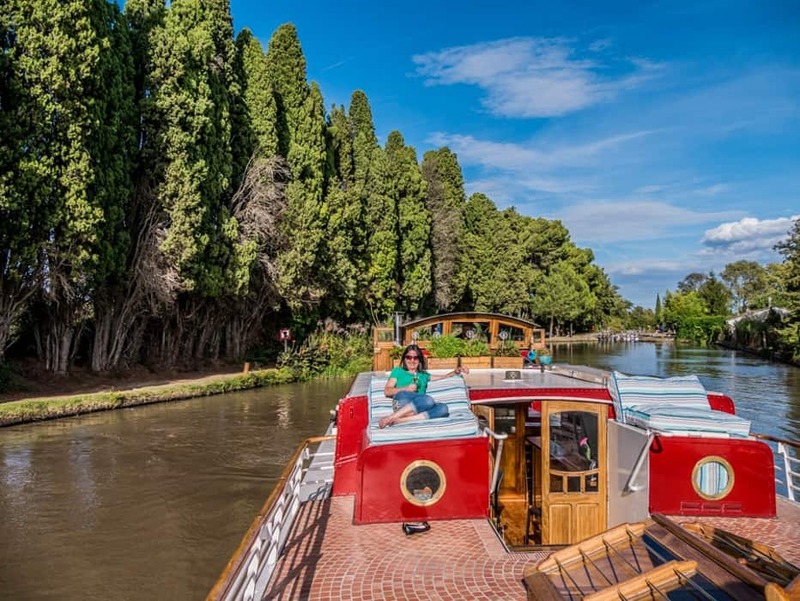 Whilst the Canal du Midi runs for 240 km from Toulouse in the south-west of France to Sète, a Mediterranean town, our cruise on the Savannah only takes in a small portion of it. 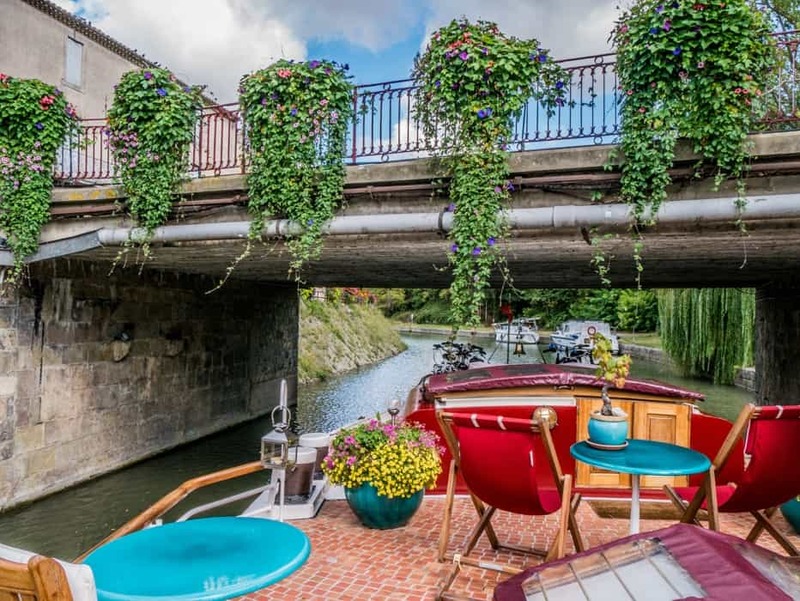 Purpose built in the 17th century for transportation purposes, one of the most beautiful canals in France has now become a home to luxury barges like the Savannah. The cruise on the Canal du Midi begins at the Aiguille Lock and passes through Marseillette, Villedubert, Ladouce, Villeseque and Beteille, finishing near Bram. It’s a cruise that joined six of us together for seven days and six nights. Three crew members are all it takes to run the Savannah and they do it so well. Captain Adrien Bramoullé is of course, the overseer. Like a general in the army, he has his finger on the pulse. Always watching, listening and making changes, as discreet as they may be, to ensure the ultimate experience is provided to his guests. Nothing is too much trouble for Adrien and his daily “check-ins” with guests ensures everything is on track. He takes the time to get to know people and encourages his team to do the same. This generates a feeling of camaraderie at a very early stage, especially difficult sometimes if all guests are strangers to each other. Adrien is a perfectionist and every aspect of his barge, and indeed the cruise is carefully planned and managed. Everything complements each other. From bedroom furnishings to the tiles on the boat he had re-created to match the originals, to impeccable taste in glassware, matched to every type of drink possible, no detail is left to chance. It also doesn’t go unnoticed. Adrien carefully recruited his team and includes them in his business. Cross trained and multi-skilled, they participate in a variety of roles on the barge, seamlessly delivering a consistent approach to their guests. In one conversation with Adrien, he noted that he encourages his staff to go on the daily activities with guests. “How can they engage in conversation with a guest about something they’ve seen if the crew have never been”, he explained. Similarly, it’s not just the chef who knows about the food either. All members of the team can tell you where the cheese we were eating came from, or what type of wine we were drinking. June, a dry witted woman with a sunny disposition from Ireland kept the laughs going all week. In her words, “everything on here is good for you” and we believed her. As we indulged each morning in our wonderful breakfasts with pastries, salads, smoked salmon, yoghurt, fruit and eggs, she desperately tried to make us eat the muesli. After her pleas went unnoticed on the first day, each day thereafter she would make us all giggle with her stage performance of “may I present to you, the muesli”. It’s silly little moments like this that I’ll never forget. I also won’t forget how June helped my husband who was suffering from a chest cold. Offering up cough syrup and making him an organic, herbal tea with eucalyptus each evening to help him out. It wasn’t asked for. It was just another example of the crew offering outstanding service. Chef Valérie Jarlet was amazing. Operating from what many chefs would consider a small kitchen, she whipped up beautiful cuisine for every meal. Whilst most of the time Valérie looked quite serious, she came alive when music played, especially when her favourite musicians came on board to entertain us during the week. The barge cruise may not be advertised with a culinary focus, but the quality of the food served makes it worthy of such branding. When Adrien mentioned that “by Wednesday, most guests usually ask us to reduce the amount of food they receive”, we all simply smiled. The six of us; two Australians and four Americans, decided collectively that we were up for the challenge. After our first delicious meal there was no way we were going to tell them to stop. By Wednesday, we understood what Adrien meant. However, we were warriors, and we harnessed our strength to keep on trying all that Valérie put in front of us. Most of the food served is organic and locally sourced. At the beginning of each trip, the majority of the food is purchased from an organic farmer near Narbonne. On the first day of the cruise, whilst we are visiting the market with the chef, the remainder of the food requirements are purchased. All fish comes from the Mediterranean or is organically farmed. As such, all meals served on board are fresh and seasonal. It’s easy to know what vegetables you will be eating by simply looking at the huge bowl of them sitting on the kitchen. Ours was filled with courgettes, eggplant, leeks, capsicums and tomatoes, all beautifully ripe and ready to eat. When questioned on the contents of her fridge, Valérie was quick to tell me “the only thing the freezer is used for is ice cream”, in her sternest French accent, highlighting just how fresh everything was. In addition, fresh bread and pastries are bought every day from local artisan boulangeries. All wines, whiskeys and cognacs are also locally sourced from within the region. There is a strong preference for local wines, and on several occasions, we saw Adrien purchase wines from those wineries we visited. According to Adrien, “On 90% of the cruises, we never open anything other than local wine, excluding the champagne, of course”. Wines are also cleverly matched with all food to further enhance the dining experience. The Savannah caters for up to seven guests, with three double cabins and one for single occupancy. The Laurgais cabin, located at the front of the barge and accessible by stairs from the upper deck, is approximately 15 square metres. The Minervois and Corbieres cabins, located directly behind the Laurgais, but accessible via the internal stairs are around 12 square metres. With king size beds and high quality linen, the rooms are cosy and inviting, and most certainly comfortable. For those hot French summer nights, the rooms are air-conditioned and portholes allow for the fresh canal breezes to waft over you. A full size shower with excellent hot water and water pressure was the highlight of my ceramic tiled bathroom. I love a good hot shower and being on a barge didn’t mean I had to sacrifice this. With a 9,000 litre water tank, we were never going to run out of fresh water. His and hers L’Occitane en Provence toiletries were a beautiful touch and a direct link to the Savannah’s past as a former showroom for L’Occitane. The rooms are serviced daily. All cabins also have skylights, which not only bring additional light in make the cabins feel more spacious. The upper deck on the Savannah was, without doubt, my favourite place to spend time. It was so much larger than I had expected, and walking around on it was not only good fun but very easy to navigate. With only six of us on board, there were plenty of opportunities to spread out in the lounges or deck chairs provided. When we all felt like being together, a large communal table provided the perfect setting to do so. Usually, it involved some delicious snacks that Valerie had put together for us, and a drink or two. This room stole my heart because of its pure beauty and ambience. Each time I walked through it, en route to my cabin, I marvelled at how such a beautiful space could exist on a barge. I couldn’t help but sit in the Christian Lacroix butterfly armchairs and smile. At other times, I was happy to sit on the leather lounges as I listened to the music gently playing throughout. The bar occupies the rich dark mahogany cupboards all around the salon. Here, top shelf labels of almost every type of liquor are available, for whenever you fancy a tipple. Nearby there are Lindt chocolates, passively tempting us to take one as we passed by. Fridges full of the finest French champagnes, wines and other drinks are also located in the salon. A constant supply of still and sparkling water is always available as is a Nespresso machine for whenever the need for caffeine calls. The open kitchen is used to its full capacity with the chef spending her time there designing and preparing the daily meals. At almost any time of the day, you can walk past the kitchen and Valérie will be preparing food for one of the upcoming meals. It was fun to just watch her as she went about a craft she’s honed since she was a little girl, growing up with restaurateur parents. Having first followed a corporate career, Valerie finally succumbed to her true passion of cooking and became a chef. I know if I was a chef, I couldn’t think of a more rewarding role than being one on a barge like the Savannah. A cosy dining room sits beside the kitchen and is useful for eating meals when the weather isn’t pleasant enough to sit up on the deck. June, our resident host, delighted us at every meal with stunning table settings. With a variety of crockery, glassware and decorations, we couldn’t wait to see what she had created for us, each time. Always refined and decorated with such class, the tables were indeed a visual feast for our eyes. Taking a cruise on the Savannah is small and intimate. Without large numbers of guests, the experience is personal and not driven by timelines. This means there are many opportunities to relax. The canals are peaceful places, with low levels of noise, making quiet time even more enjoyable. The barge is moored each evening in a quiet, countryside location, a deliberate strategy by the captain. The generators that power the boat during the day are switched off at night. When it is finally time to lay your head down after a wonderful day on the canal, not a sound can be heard. Such is the stability of the barge and the calmness of the canal waters that it is quite easy to forget you are on the water. With no city lights and no noise, it be would hard for anyone to not have a long and restful sleep. Travelling through the canal at a slow pace is therapeutic, allowing for time to relax your body and your mind. With a top speed of approximately four kilometres per hour, there’s no choice but to take time out. For those active people or just ones that can never sit still for too long, like me, the daily activities are the perfect accompaniment. One of the keys to making this one of the best barge cruises in France has to be the extra activities that are included in the itinerary. During the week we were fortunate to visit some amazing locations and meet incredible people. Apart from the medieval city of Carcassonne, most of the destinations were not areas regularly visited by large numbers of tourists. We spent time with the matriarch of a vineyard that has been in the one family for 400 years. Drinking their wine, as great as it was, became secondary to the conversation with her. Chef Valérie took us to the covered Les Halles market in Narbonne, introducing us to some of her favourite local suppliers and encouraging us to taste as we went. We spent time exploring old villages perched high on hilltops, walked through caves, went hunting for treasure and listened to Russian singers in a cathedral. Private tour guides escorted us on several occasions, but often it was the local stories from Adrien that held us captivated the most. There were private wine tastings of organic wine on board. One evening we were made to feel extremely special when two musicians serenaded us with their beautiful music both before and after dinner. As if that wasn’t enough, the opportunity to drive vintage Citroen 2CVs along dusty country roads to a typical French chateau was amazing. We ate at two local restaurants, carefully chosen by Adrien, each with their own story and delicious food. The barge also carries six bicycles that are kept in good condition, making riding along the towpaths an enjoyable outing. We took advantage of the bikes, riding at first alongside the Savannah and then meeting her further up the lock a few kilometres away. The distances between locks are the only factor in determining how far you travel. Access on and off the barge whilst cruising, can only be done when passing through the locks. Wifi is listed as being available on board, with a disclaimer that receiving service can sometimes be difficult along the canal. This is accurately reflected and wifi is patchy. If having regular and consistent access to wifi is important, I would suggest taking a portable wifi solution with you or having it available on your travel phone plan. I had this with me and was always connected. Many of the other guests also logged onto my device. Electricity is also available, both on the upper deck, in the salon and in the bedrooms for charging of devices and other appliances. Deciding on what to pack for this cruise couldn’t be easier. Unlike many other cruises, there are no official functions and no requirements to dress formally. The dress code follows the same philosophy of every other aspect on board, relaxed and casual. We didn’t feel as though we over packed for this trip, however, we still took more than we ultimately required. On many days, we all remained in the same clothes throughout the day and evening. Depending on the weather, a mix of shorts/skirt, long pants/jeans, shirts and a jacket would be enough. Dressing up is an option for the final farewell dinner although this is not a requirement. It was a little windy on several of the days we were onboard, so a scarf also came in handy. Packing clothes that layer well would be an advantage. On board the boat we always wore flat shoes (no need for high heels at all here) or flip flops, and we also used our running shoes for some of the daily activities. It’s also a great idea to pack some active wear for those opportunities to cycle or walk beside the canal. Remember to pack a hat for the hot weather too. The trip officially commences in Narbonne, located in the south-west of France. We arrived via train from Barcelona, a trip that took only two hours. Narbonne is also serviced by its closest airport at Beziers, but there are many other alternatives available, depending on where you are travelling from. A private transfer collected us from our hotel and took us directly to the starting point of the cruise. Adrien, the captain, picked us up on time, and with some brief introductions aside, we quickly got into his vehicle and started chatting with him en route to picking up the other guests. Forty minutes later, we were at the Aiguille lock with our new-found friends from Miami. The ease of the private transfer sets the scene for a relaxing week of cruising where every minute detail is taken care of for you. This is a luxury cruise with an all-inclusive package and absolutely no hidden extras. However, leaving a gratuity is encouraged. The cost for the seven days/six night cruise covers all meals including any that are had onshore during daily activities. Access to the open bar and all beverages served on board are also part of the overall price. Use of the on board bikes, all daily activities and related tours and wine tasting are included, as are the private transfers. What Makes the Savannah Different? The standout features for me were the outstanding customer service and attention to detail. Without this, the trip becomes just another cruise, albeit on a beautiful boat on a beautiful canal. Every minute on board the Savannah I felt special. Guests were appreciated and respected for choosing this cruise, when they could have quite possibly chosen others. Once again, this was where Adrien’s understanding of his guests and his market are obvious. “You can see it’s a fantasy for some people”, says Adrien, “Sometimes it’s a one-off trip for people and they may never experience something like this again”. They aim to please and adapt where necessary. He uses this understanding to not only cater for their needs on board, but to be flexible in his offering to prospective guests. This flexibility is yet another feature that makes a cruise aboard the Savannah different to other canal cruises on the market. Savannah barge cruises may be transformed into gastronomy tours, or for bike loving people, a Tour de France cruise, complete with professional bicycles. There may be a focus on chocolate, on wine tasting or truffles. If fishing is your thing, fishing rods and charters may be organised. Children are not left out of this scenario, with the barge openly welcoming the inclusion of families with kids. Perhaps the only thing that can’t be done is to bring your favourite pet on board. Our time on the Savannah was memorable for so many reasons. Having visited, and driven, all around France on many occasions, barging on a canal was something we knew we would do someday. However, as very independent travellers, I always thought we would hire a barge ourselves, not usually keen to be involved in tours or organised events. This is where the week on the Savannah was completely different to what I had expected. Whilst there are certain timelines for daily activities, it never felt untenable. In actual fact, on every occasion, we were super excited to go. Meal times were largely built around our day, giving us enough time to relax, chat about the day and generally unwind. They also varied day-to-day so nothing ever felt regimented. We were free to roam about the barge whenever and however we liked, and jump on and off the boat to get some exercise in the same manner. We thoroughly enjoyed spending time with the captain in the wheelhouse, watching him navigate this enormous, 180 tonne beast through the narrow canals. The irony of it all, was one of the best aspects was not having to drive the barge ourselves. Having watched others who hired these boats struggle at times with navigation and handling, it was a far easier task to sit back and let Adrien do all the hard work, especially at the locks. Of course, doing it in such decadent style was always going to be hard to beat. Everything on board the Savannah lives up to the luxury tag. From the moment we arrived, no stone was left unturned in providing the most luxurious experience I have ever had. Perhaps it helped enormously that we love good food and wine and being involved in the whole market to cooking process. This barge cruise in France was an absolute standout, and I would do it all again in a heartbeat. The Fit Traveller was a guest of the Savannah and Barge Lady Cruises for this cruise. As always, the opinions, words and images are authentically our own.